This post was randomly deleted when blogger went down and has mysteriously reappeared! I love the pics so I'm reposting. Yesterday I introduced my girl to her swimsuit! I love her girlie little suit and think she looks adorable in it. 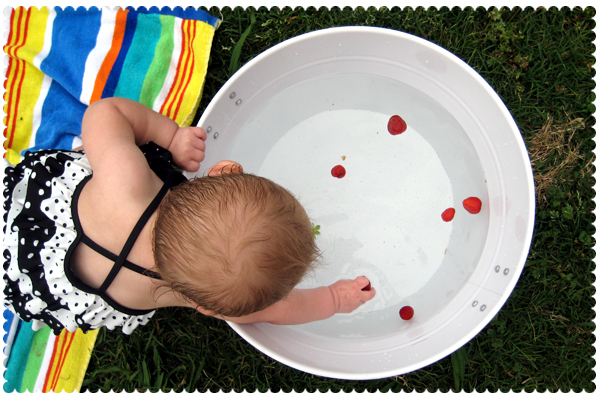 I filled a bucket up with water and she was a little unsure of the cold water at first but then decided she liked it! 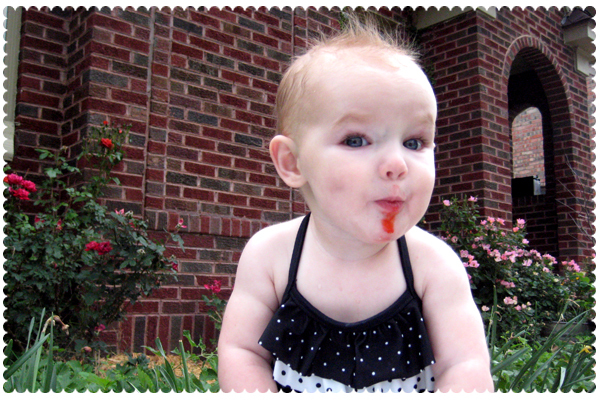 And when she had enough of the water, we ate strawberries. She eats them so fast so to slow her down a little, I put them in the bucket so she could fish them out on her own. It didn't take her long to finish them off. 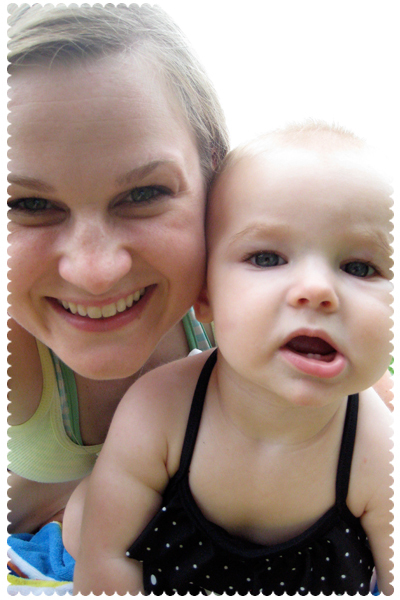 And, for Embrace the Camera with Emily, one of me and my gal. OMGOSH! How cute! Makes me want to go swimming! I love her swimsuit! And why is your bucket even cute? adorable, love the bathing suit! That swimsuit is the most adorable thing ever! 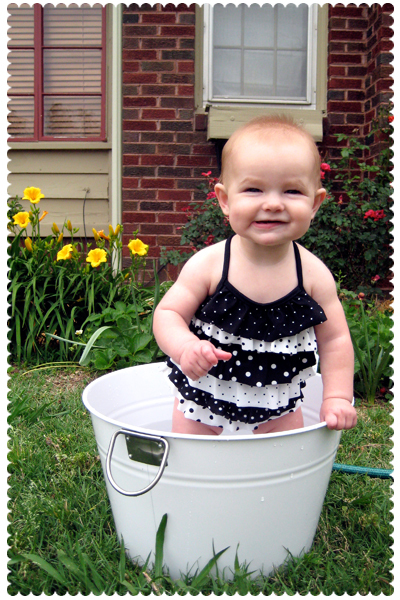 And I agree with Jami, that bucket is adorable! Too cute! She looks so adorable in her swimsuit...what a great smile she has!! 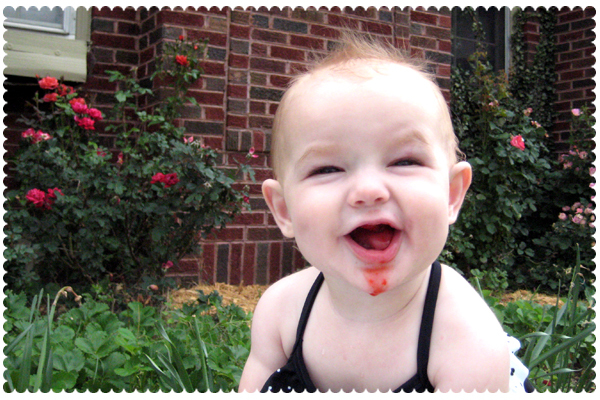 Just found your blog, and all I want to say that she is the most adorable little one I have seen in a very long time! She's got her mommy's smile for sure! Oh my gosh, this is so ridiculously cute I feel like I should be expressing some kind of GREAT EMOTION! :D She truly is a Sweet P, and such a ham, too! I can't believe how you could fit all that adorable into one single bucket. Your little chick is adorable! :) Love that smile!